A week before the start of the Liberal Republican Convention in Cincinnati, a tiny, unusual, insightful sketch by Nast appeared in Harper’s Weekly (dated May 4, published April 24). 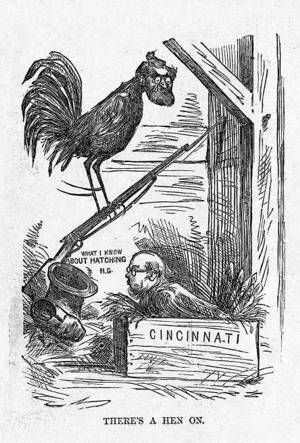 Entitled “There’s a Hen On,” it depicts Senator Carl Schurz, chairman of the upcoming convention, as a paternal rooster, perched on a rifle with fixed bayonet, keeping close and apprehensive watch over Horace Greeley, in the guise of a hen sitting on the Liberal Republican eggs in the Cincinnati box. The inscription between the gun and hat, normally to be found on a paper protruding from Greeley’s coat pocket, says “What I Know About Hatching. H. G.” The image manifests the anxiety that Schurz, a supporter of diplomat Charles Francis Adams for the presidential nomination, felt toward Greeley’s intentions for his representatives at the convention.